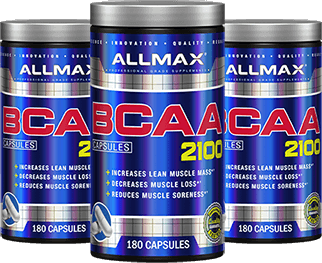 Now get all the benefits of ALLMAX BCAAs in a convenient capsule form! Unlike other amino acids, BCAAs are unique in that they are taken up by the muscles directly, whereas other aminos are processed by the liver. BCAAs are critical to building quality muscle fast. * BCAAs are widely known to increase the rate of muscle growth in response to training. * In fact, research indicates that as much as 35% of muscle tissue is comprised of BCAAs. L-Isoleucine – provides muscle recovery post-workout and has been found to be helpful to assist in supporting blood sugar levels already within normal range. * Isoleucine can increase energy levels and extend endurance. 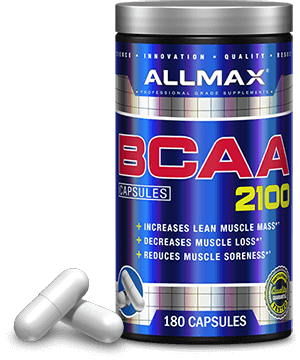 ALLMAX high quality BCAA 2:1:1 Capsules are a pure formulation with absolutely nothing else added and uses cGMP manufacturing processes. 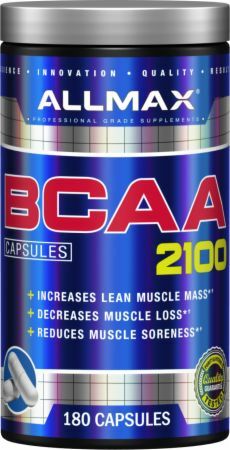 No BCAA 2100 Reviews Found. ALLERGEN WARNING: Produced in a facility that also handles Milk, Egg, Tree Nut, Peanut, Fish, Crustacean and Shellfish products. Directions For BCAA 2100: Take 1 Serving (3 Capsules) with water or juice one to two times daily. Warnings: Keep out of reach of children. Check with a qualified healthcare professional before taking this product if you are pregnant, nursing a baby, under 18 years of age, or if you have any known or suspected medical condition(s) and/or are taking any prescription or OTC medication(s). Store in a cool, dry place away from sunlight.